Abort! Abort! Too Much! Too Much! 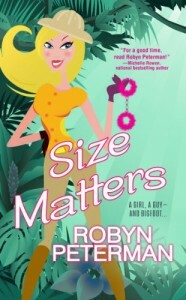 I should probably disclaimer that I DNF'd Seduction and Snacks for being too over-the-top for my liking, so I know that there might be a group of people who will devour Size Matters and have a lot of fun with it. To be fair, Size Matters was funny. I found myself laughing at several of the jokes (and at one fake Mariah Carey). But the humor was trying to be "on" all of the time. I'd rather see a page of good dialogue or action with a great one-liner, rather than line after line of forced humor, especially when the jokes start to repeat themselves over and over. The first few times "Lutheran Jesus, Cardboard Brett Favre, David Hasselhoff, motherhumping assclowns" etc.were mentioned, it was funny...before I got tired of seeing these punchlines recycled multiple times. Spazzy humor has probably run its course for me. Trigger Warning : the word "fucktard" is used several times. I know a few of my friends are sensitive to this word, so I figured it was worth a mention. This book was provided from the publisher in exchange for an honest review.